The trip starts with a really stupid crash on my bicycle back in my home town the day I leave. With a hurting wrist I carry my bikebag and the other stuff from train to train and finally into the Frankfurt airport. Some hours flight, a long stopover in Dubai Airport. Arriving in Kuala Lumpur at night, bound to take of for Vietnam the next morning. From the regular airport by bus to the LCCT, where I find nice company to talk about Nepal and Thailand all night. While boarding the plane, my group gets lost walking the runways, ends up on the wrong plane. Sleep deprivated as I am, I only laugh about this. Reaching Hanoi in the morning. Wrist still hurst like mad. Well, why not take a taxi into town and then a bus directly on Cat Ba and relax a few days in Halong bay, I think. And so I start to pay my education fee to some smart Vietnamese, with no idea about the prices nor exchange rates. Eventually I reach Hai Phong by bus. The driver, who sold me a ticket to Cat Ba, drops my bags out of the bus and disappears. A flock of motorbike and taxi drivers surrounds me and wants to "give me a lift". The staff at the bus terminal isn't really helpfull either. No one really speaking English. I'm tired, but determined not to waste any more money on them. Start to assamble my bike right in front of the bus terminal, still surrounded by a dozen of smiling kids and another dozen of taxi drivers who touch basically every part of the bike. Scary... The constant stream of horning motorbikes and busses and lorries just ahead of me is even more scarry. Finally, the bike is ready and working well - my biggest concern is calmed. But where is the ferry port? No signs visible at all. One of the guys points to a direction... Off I go, eventually getting the drive and enjoy the messy traffic. Next morning I discover a nice bakery just next door, the splendid view of the (noisy) harbor and the limestone rocks behind the line of hotels along the street. Two nice small beaches just half a mile away from the town, swimming in the warm sea in the morning sun. That's Asia, that's what I wanted. 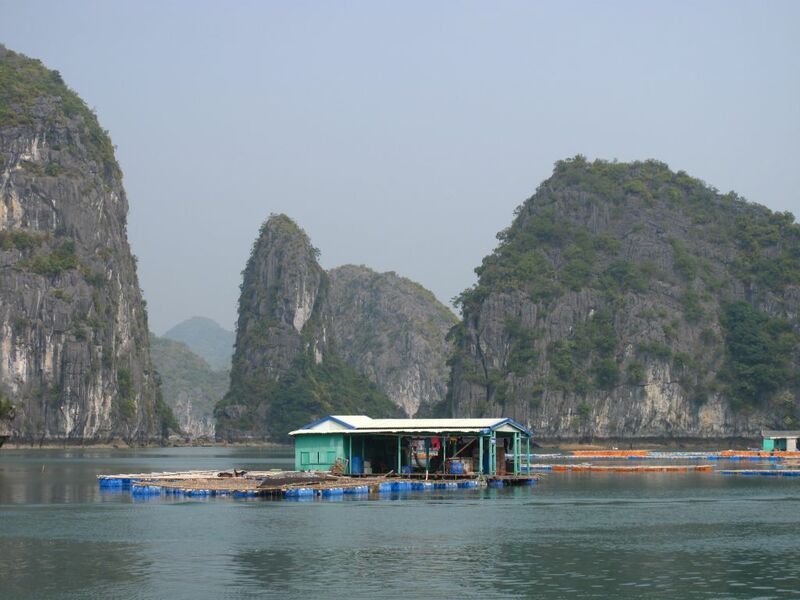 Spent days then cruising Halong Bay on houseboats and kajaking, hanging out on tiny beaches on small Robinson islands and collecting Shiva eye stones. Trecking in the Cat Ba National Park. Meet the right people in town, get the flow, fall in love and keep postponing my departure. Heaven, sort of. Why leave?